A B M P m e m b e r s e a r n F R E E C E a t w w w. a b m p . c o m / c e b y r e a d i n g M a s s a g e & B o d y w o r k m a g a z i n e 33 HEART OF BODYWORK best practices An issue that always sparks spirited discussion on social media is massage therapy and tipping. It's always disturbing to me when I see a question like, "How can I let my clients know I expect a tip?" The correct answer to that question is multifaceted. First, if you expect it, it's not a tip. A tip is a gratuity, something extra on top of your fee (or payment, if you work for someone else), meant to show gratitude for exceptional service. If you're self-employed and you think you "deserve" a tip, then raise your hourly rate to the amount of money you truly want to make, and get over the attitude that you "expect" a tip. It's unethical to hold a client hostage for a tip, and you should be giving everyone the same exceptional service, whether they tip or not. Tip jars or signs in the treatment room, or dropping hints about an expected tip, are just plain unprofessional. Second, do you consider yourself to be a service provider, or a member of the health-care team? 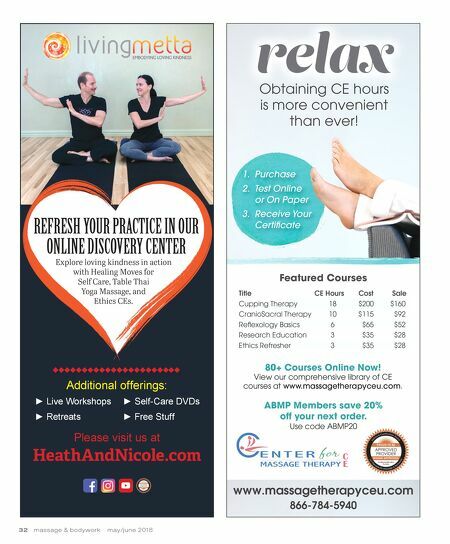 Tipping a massage therapist is common in spas and salons, on cruise ships, and in other venues where massage is apt to be more of a pampering excursion than a health- care service. People don't tip doctors, nurses, physical therapists, or other health-care providers, and it would be considered an ethics violation in those professions to accept one. If you desire to represent yourself as a health- care provider, whether that's legally designated in your jurisdiction or not, accepting tips is not representative of that image. If you're employed in a hospital, chiropractic, or medical office, it may, in fact, be illegal to accept a tip. Third, if you're an employee in someone else's business, there may be a tipping policy. Some employers encourage tips by handing the client an envelope, or by having people at the front desk encourage clients to tip, and Massage Therapy & Tipping By Laura Allen some may go so far as to automatically add it to the bill— whether clients feel like they got top-notch service or not. The best tip clients can give you is to refer other clients. 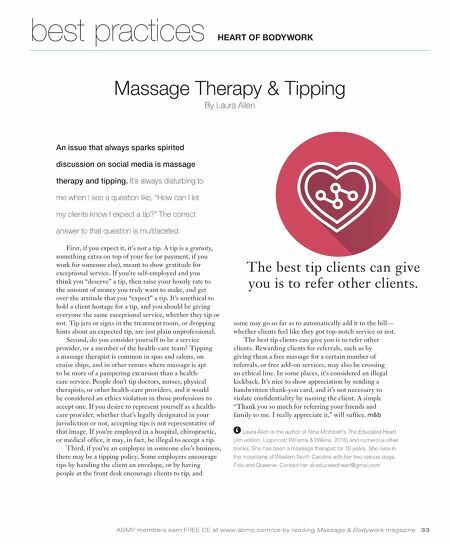 Rewarding clients for referrals, such as by giving them a free massage for a certain number of referrals, or free add-on services, may also be crossing an ethical line. In some places, it's considered an illegal kickback. It's nice to show appreciation by sending a handwritten thank-you card, and it's not necessary to violate confidentiality by naming the client. A simple "Thank you so much for referring your friends and family to me. I really appreciate it," will suffice. Laura Allen is the author of Nina McIntosh's The Educated Heart (4th edition, Lippincott Williams & Wilkins, 2016) and numerous other books. She has been a massage therapist for 18 years. She lives in the mountains of Western North Carolina with her two rescue dogs, Fido and Queenie. Contact her at educatedheart@gmail.com. The best tip clients can give you is to refer other clients.